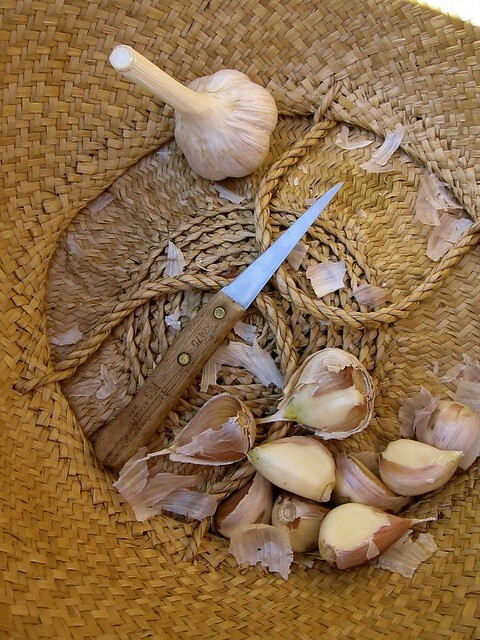 Planting garlic is one of the most hopeful acts in the garden, a commitment to the next season. It’s the last to go in the ground and, when spring returns, the first to come up. We patiently peel back the cloves, inspecting them for mite damage, and select only the perfect, unblemished ones for planting. This isn’t an entirely necessary step, though our plot is too small to let it fall entirely to chance. The trick is to grow enough garlic to last us until spring, and to replant from. We need 48 cloves of Music, 48 cloves of Phillips, and 12 cloves of Rossa di Sulmona to fill the bed. If all goes well, we’ll plant more of the Rossa di Sulmona next season. 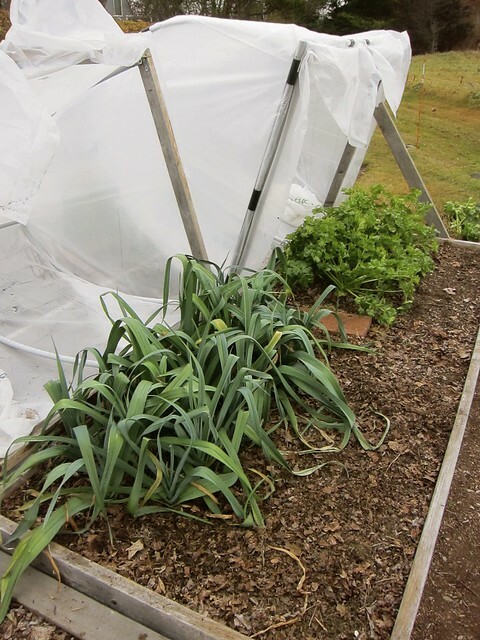 Once the garlic cloves are snug in the ground, a layer of compost goes on top, plus 3 to 4 inches of leaf mulch as added protection through winter. 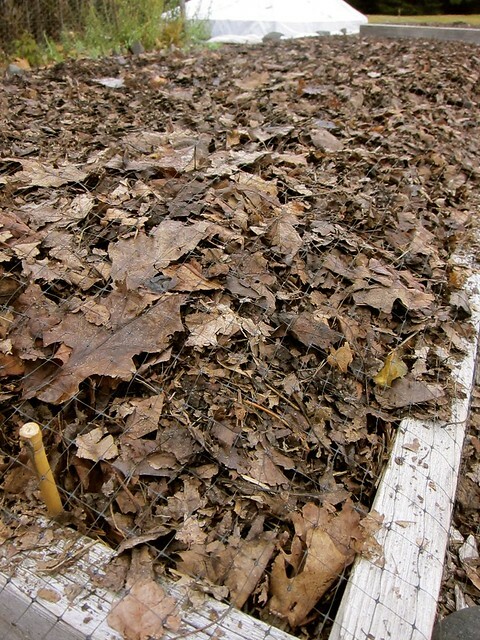 The netting is to keep the mulch in place and to dissuade foragers. 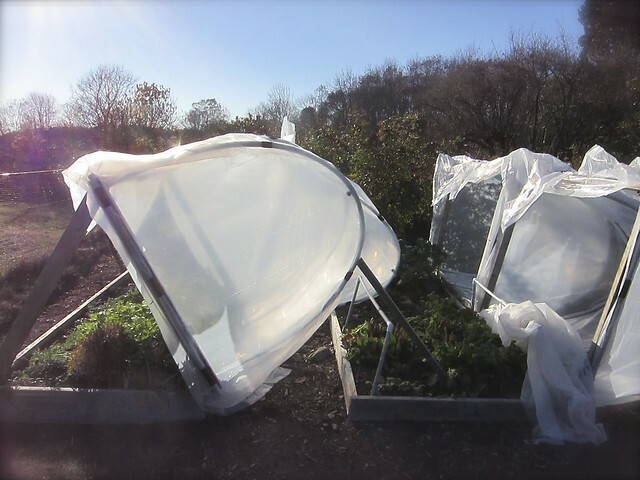 We lift the row covers whenever temperatures wander over 50°F, which gives us a chance to check on the beds. 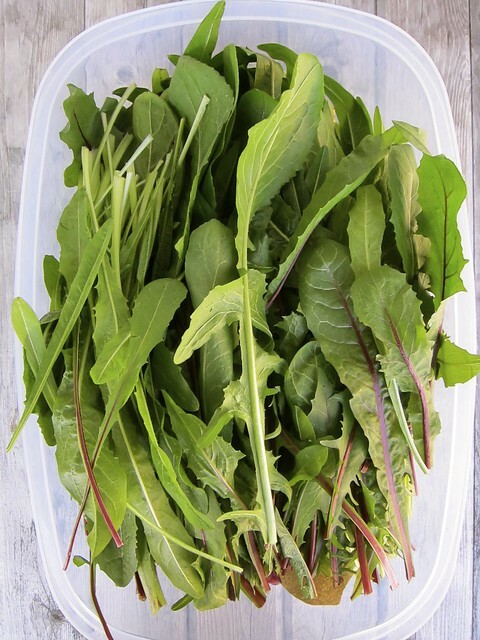 Above: Salad greens, arugula, chard and kale on the left; leeks and celeriac to the right. 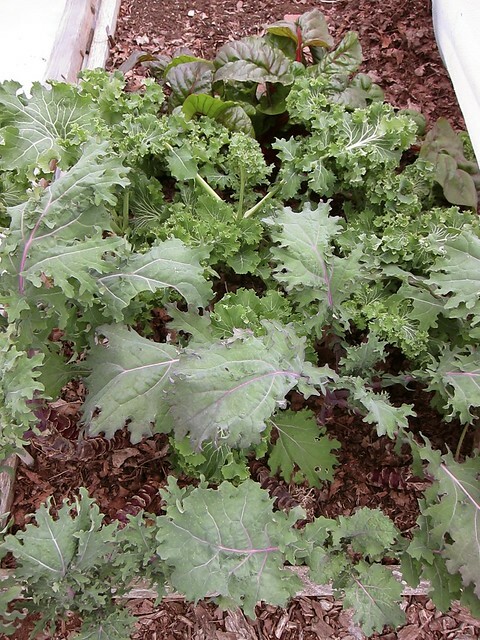 Kale becomes precious this time of year, when we most appreciate their sturdy leaves, sweetened up from the cold. The chicories rebounded after being browsed by deer, allowing us to harvest it far into fall. We took one last crop before they succumbed to frost damage and, in a take-off on the Pugliese dish Fave e Cicoria, braised the lot to serve with Christmas Limas. These are the last of the carrots, called Napoli, which have been a dependable variety for us. 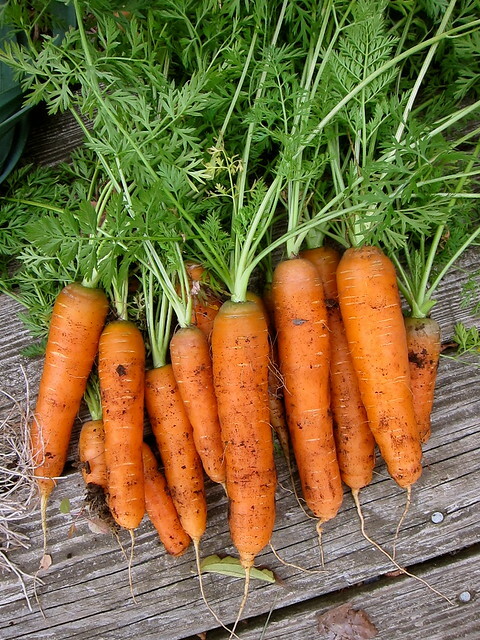 Growing carrots this late into the season makes them extra crispy and sweet. 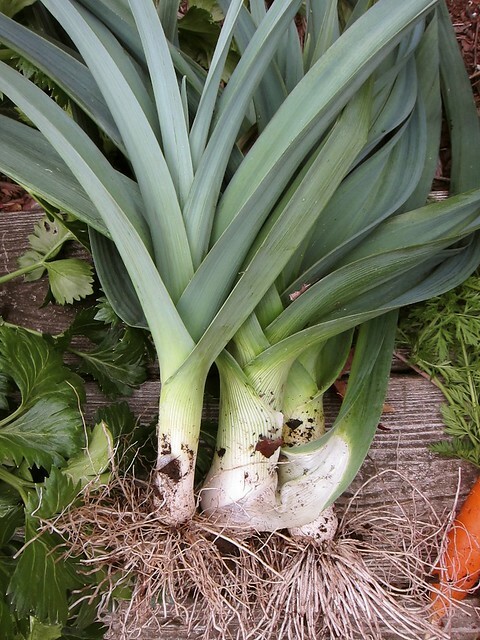 We pulled up some leeks to check on their progress — the King Sieg is a cross from the Siegfried, and both are meant to overwinter. 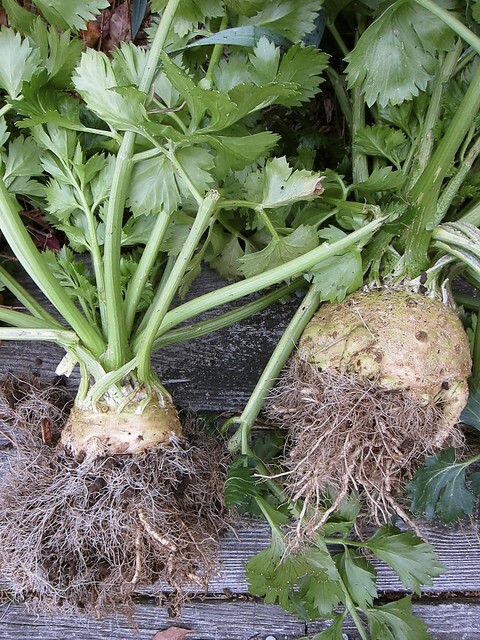 These bearded celeriac are a variety called Brilliant. The more conventionally sized one on the left is about that of a softball, and get pithy when too large. We like their earthy, parsley-like flavor, and served these mashed with buttery potatoes. This week’s harvest all cleaned up and ready for their beauty shot. 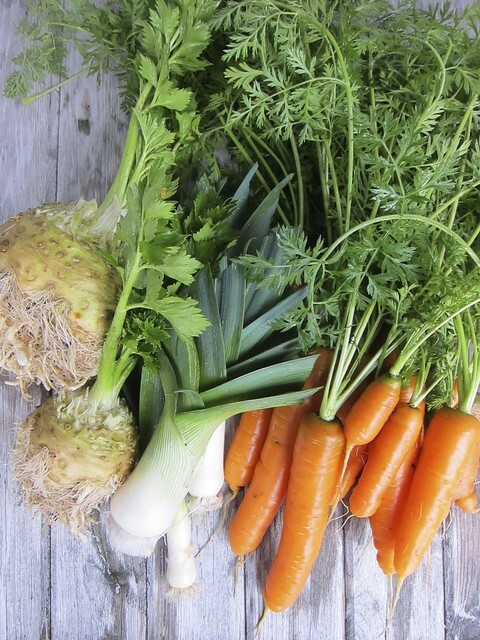 Harvesting: Last of carrots, 3 leeks, 2 celeriac, salad greens, and last of chicory. 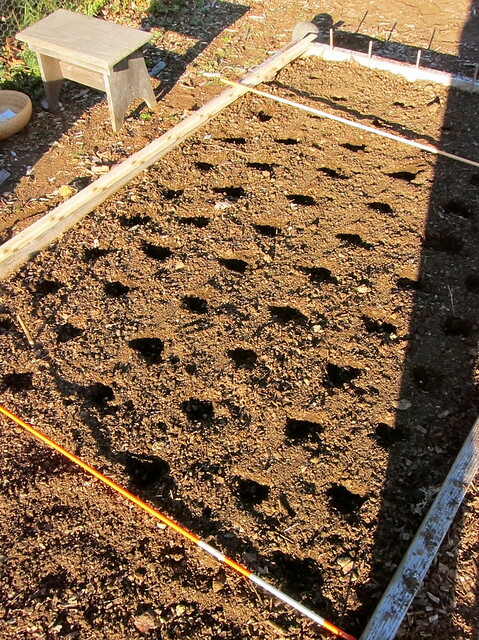 In ground: Tatsoi, chard, kale, salad greens, leeks, and celeriac. In storage: Beets, carrots, potatoes, apples, winter squash, winter radishes, turnips, rutabaga, onions, garlic, winter tomatoes, and ground cherries. 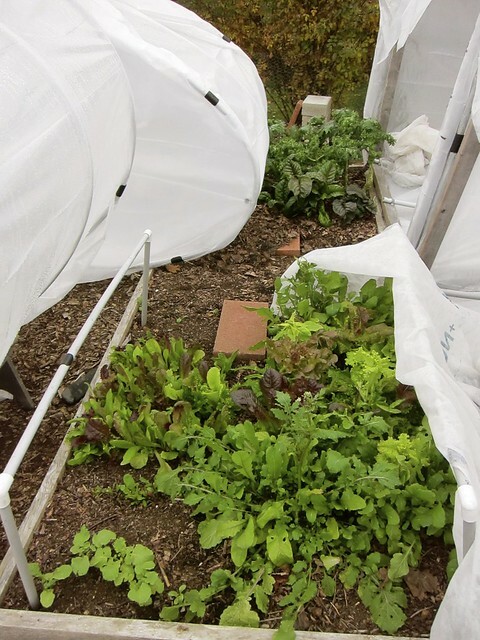 This entry was posted in garden and tagged carrots, celeriac, chard, chicory, garlic, kale, leeks, puntarelle, salad greens, season extension. Bookmark the permalink. Planting garlic is one of my most favorite garden activities. 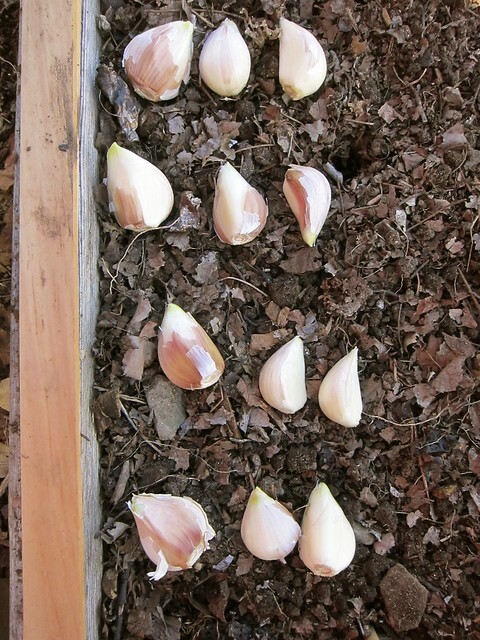 Planting only the largest cloves produces the largest bulbs. I plant the smaller clove in another part of the garden for green garlic and use garlic leaves as needed until the new harvest is ready. Love the netting… my father could use that! My dream is to have a plentiful garden someday.. currently not possible from a flat in London! Beautiful carrots and leeks, like how you mulch the garlic bed and top it with netting. I planted my carrots a bit too late, they are small but usable. Beautiful kale, the one in the middle looks like the Beedy’s Camden I am growing. Everytime I read one of your posts, I day dream of having a garden. Oh, how wonderful. I do miss having a vegetable garden…. but we’re lucky to have great farmers’ markets to provide. All those greens look lovely. I hope that your winter garden keeps producing!